Want to retire where residents live a long life, there are lots of doctors and hospitals nearby, and you can pursue an active lifestyle? 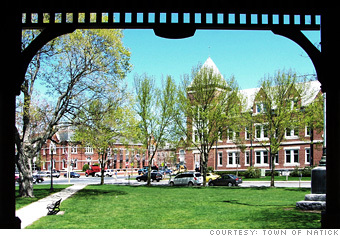 Check out these 20 towns. You can indulge in New England's legendary seafood here to help keep your heart strong, and enjoy the freshest farm produce, too. Head to neighboring Sherborn's 100-acre Sunshine Farm, a third-generation family operation, for locally grown fruits and vegetables. During the summer, pick your own strawberries and raspberries, or treat yourself to homemade ice cream with flavors like pomegranate chip. Prefer a little "American Pie"? Singer/songwriter Don McLean is scheduled to perform at the 12th anniversary of Natick's Center for Arts in early October. Shopping more your speed? Train for a buying marathon at the largest mall in New England, which features more than 200 retail stores. --H.Y.